After a rigorous day of routine training sessions, Detective Rollins heads home to find her apartment door cracked open. She cautiously enters and finds her sister, Kim, hanging out in her apartment. Kim shows Rollins a black eye from her ex-boyfriend, who is on his way to New York because Kim is pregnant with his baby. Rollins is less than thrilled. The next morning, Rollins arrives late to work and informs the squad of her sister's ordeal. Fin and Amaro offer to help by tracking down Kim's ex-boyfriend and sending him home. They find Jeff at a bar and strongly urge him to go back to Georgia. After Jeff tracks down Kim at a baby store, Rollins helps Kim file a restraining order. Benson and Fin track down Jeff to serve him his papers. Later, Rollins returns home to find Jeff attacking Kim in her living room. Jeff pulls a gun on Rollins and she fires twice, killing Jeff. An hour later, Rollins' apartment is swarming with investigators. The lead investigator, Lieutenant Tucker, seems to have it out for Rollins. She's ordered to meet with the police psychiatrist the following day. In the psychiatrist's office, Rollins expresses no remorse for her actions, saying that Jeff was warned and that he pulled a gun on her. Later, Lieutenant Tucker interrogates Rollins about the events of the evening. For the meantime, Rollins' apartment is a crime scene, so she and Kim stay with Fin. Strangely, this situation seems to have brought the sisters closer together. The next day, Kim visits Lieutenant Tucker to tell him that Rollins has had run-ins with Jeff before. Tucker uses this as ammunition to claim that Rollins acted irresponsibly when she shot and killed Jeff. At home, Rollins confronts Kim about what she told Tucker, and Kim reveals that she took out a life insurance policy on Jeff. She also tells Rollins that her name is on the policy as well. This is not good for Rollins. Rollins immediately takes the information to Lieutenant Tucker, who appreciates Rollins' honesty. He then questions Rollins about her gambling history. Rollins still technically owes a lot of money to imprisoned bookies, and she opened a life insurance policy on a man she just killed. Tucker is clearly still gunning for Rollins' badge. Tucker meets with Kim again to dig for more information about the life insurance policy. Kim tells Tucker that it was all Rollins' idea, and Tucker comes to SVU headquarters to place Rollins under arrest. Cragen rushes to secure a lawyer for Rollins. In a surreal turn of events, Rollins is processed and placed in a holding cell. Later, Rollins' attorney, Horowitz, stops by for a visit. Meanwhile, the rest of the SVU squad begins working to clear Rollins' name. Fin thinks that Kim set Rollins up to kill Jeff, and after some discussion the other detectives begin to put the pieces together. 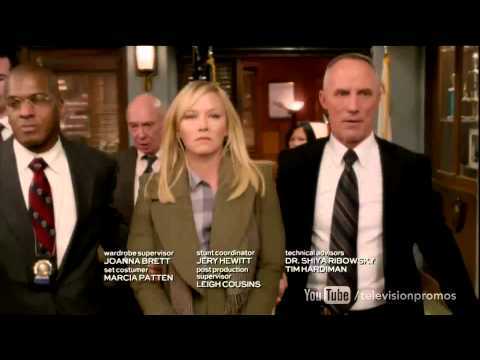 Cragen takes care of Rollins' bail and she immediately tracks down Kim to confront her. Kim plays dumb, saying that she didn't mean for any of this to happen. Rollins keeps digging, though, and eventually Kim confesses to setting up Rollins so that she would kill Jeff. Rollins leaves, heartbroken. Kim meets Amaro outside of the station, and Amaro reluctantly agrees to join her for dinner in order to dig for information that might clear Rollins' name. Unbeknownst to Kim, Amaro records the entire conversation. When Tucker hears the recordings, he agrees to clear Rollins' name and pursue legal action against Kim instead. Rollins tries to fight him, still devoted to her sister, but Cragen urges Rollins to let it go. Tucker heads to Kim's motel room, but she's already gone. Rollins returns home to find that Kim has robbed her apartment and taken everything.